The Humvee is a 1980s design, which has been showing its age in Iraq and Afghanistan. 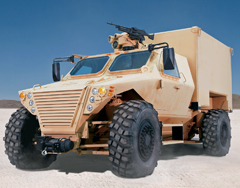 Oshkosh Corp. has partnered with Northrop Grumman , submitting a modular design that focuses on protecting the occupants. “It&apos;s a unique design,” says Juergens. “We think it&apos;s something that will carry on very nicely, for the next thirty to forty years.” With that time frame in mind, Juergens says the Oshkosh design will lend itself to changes in mission, armor and power plants. Juergens believes landing a production contract could be a “game changer” for the company and the Fox Valley, with some 60,000 to 80,000 vehicles projected. “We will have to expand, and it will offer thousands of jobs. It will be a huge economic boost for our area.” It&apos;s a long process, though: the Pentagon will not be awarding JLTV production contracts until 2012.